You’re familiar with the Food Guide Pyramid (left), but did you know that it's recommendations are directly influenced by the cereal manufacturers? It stresses lots of carbohydrates and very little proteins and natural fats. 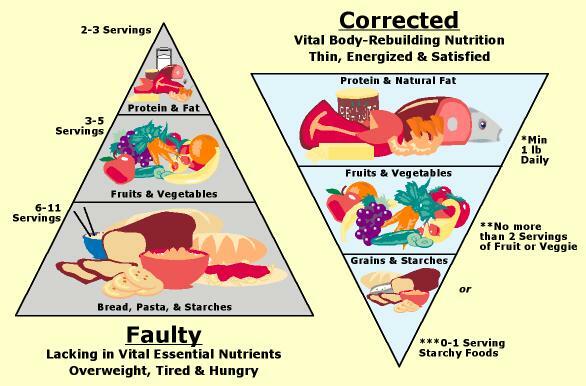 When you learn how your body really handles food, and what you need to maintain good health and avoid the development of degenerative diseases, you will see that in order to be a proper guide to nutritious eating, the familiar food pyramid should be flipped upside-down! Take a look at the serving sizes from the Faulty Food Guide Pyramid! Is it any wonder we’re facing an epidemic of obesity, as well as growing incidence of degenerative disease!? Not only are we told to eat massive amounts of food all day long, but the food that is most highly recommended is almost all converted to Glucose (SUGAR) by the body, and contains little to NO nutritional value. A high consumption of carbohydrate foods can lead directly to the development of Diabetes. A mere 1% of the pancreas is devoted to handling carbohydrates, while the other 99% is devoted to processing natural fat and protein. We must look at the function of the organ to understand what is intended to be the foundation of our diet. Obviously it goes against the function of the pancreas to base the foundation of our diet on carbohydrates! This severe overworking of the pancreas essentially "kills" it. Some people have a stronger constitution while others are more prone to developing Diabetes. Regardless, it's the high consumption of sugars in the diet that creates this disease. It is completely preventable. The very fact that a natural carbohydrate intolerance creates Diabetes should throw up a red flag to those with the disease who are following carbohydrate loading recommendations. These recommendations have diabetics loading up on the very food they've developed an intolerance to. This makes no sense! Thousands with Diabetes have greatly reduced their consumption of carbohydrates and as a result, they have finally gotten their blood sugar levels under control. Some have even been able to stop their medication! This makes perfect sense when an understanding of the body is gained and real life results replaces opinion! See the Bibliography and the Index by Subject to get direct references in support of these statements.